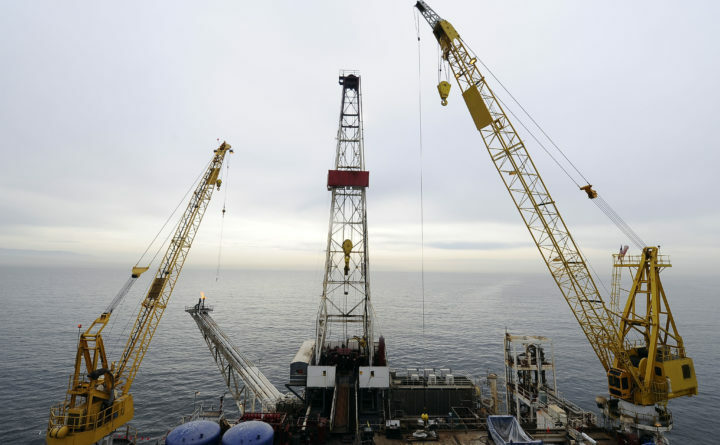 In this May 1, 2009 file photo, offshore oil drilling platform 'Gail' operated by Venoco, Inc., is shown off the coast of Santa Barbara, Calif. The lawmakers’ announcement came as new and re-elected legislators were entering office around the country after an election that saw high turnover in some states, and the group said it wants to take advantage of new political dynamics that could favor environmental bills. The announcement also came about a year after Trump’s administration announced plans to expand drilling. Others lawmakers involved in the effort represent Connecticut, Georgia, Hawaii, Maine, Massachusetts, New York, Oregon and Rhode Island. Some of the lawmakers said they would seek outright bans on drilling, while others said they would look to pass bills that restrict it or do more to hold companies liable for spills. A message was left seeking comment from the oil and gas industry group American Petroleum Institute. The practical impact of some of the bills could be that they make it more difficult from companies that seek to drill to access offshore sites via state waters, members of the group said. Several states have already taken action to ban offshore drilling in state waters. New Jersey passed one of the strongest laws on the subject last year. Lawmakers in coastal states are acting on the subject because of potential harms to critical industries such as tourism and commercial fishing, said Oregon Sen. Arnie Roblan. They lawmakers also said their respective states must do more to encourage renewable energy rather than fossil fuel extraction. Rep. Park Cannon of Georgia said she expected a fight against defenders of “archaic energy practices” in her state. “It’s time to transition away from dirty fossil fuels to renewable energy,” said Hawaii Sen. Mike Gabbard, who said he would introduce a ban on oil drilling off Hawaii when the session starts next week.